I've spent nearly a month on a pilgramage in the holy city of Tzfat (Saded), in Israel. I rented an apartment that was up on the hill near the Citadel ruins, on top of the old city. I spent every morning davening in ancient synaguages, of which there are several in the city, centered on the 15th and 16th century community largely populated by Sephardi Jews who were explused from Spain with the Spanish Inqusition. Tzfat is one of the most beautiful and special places in the world and it attracts an eclectic group of residents. 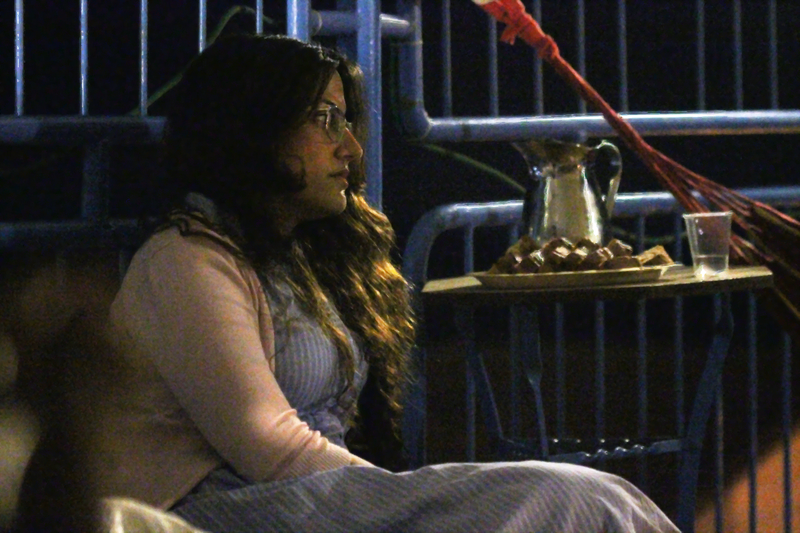 Aside from the lovely scenery and history, the real beauty of Tzfat is its people. It has several fantastic organizations and warm residents. This would include Ascent of Tzfat, Livnot, and several Yeshivot. Livnot, for example, targets Jewish young adults new to Jewish culture, with programing involving Judiac education, a campus with dormatories, and creative programs that leverage the local lore and history. What makes the Livnot foundation different is that it is actively involved in the physical development of Tzfat. Tzfat has been destroyed by earthquakes numerous times over the millinium. the last great quake, that killed nearly 4000 people, destroyed much of the housing and left it in ruins. Added to this the battles about the birth of Israel left many empty lots, and homes, with fallen stones all about. Typical old city development means first sorting out ownership of properties, which can include hundreds of individual family members with shares of a property, fending off the locate maffia that exploits this situation to extort property owners with sudden mystery claims of small ownership shares of existing properties, enforced with illegal violence, and then rebuilding. When you get a property, several historical layers exist under you of destroyed structures and arches. Here is Aaron Botzer, showing several of these layers with me. Livnots property runs from the Jewish Artist center to the Abuhav Synagogue complex. More support for young people is available from the Youth Hostile created by Rabbi Shaul Yosef Leiter, called Ascent. Ascent creates a safe haven and active local for Jewish men and women of a variety of ages. It is a chabad hotbed for missionary work that relentlessly pushes the Tanyah and the Lubavitcher Hasidic message, but it also represents all of the best public works of Chabad. If forsters the Jewish community and outreach, in a friendly and loving environment. If you desire such an environemnt then Ascent gives it to you in spades, and it is one of the most effective recruitment tools for Chabad in the world, and by extention all of Yidishkeit. It has a legion of volunteers and a full day menu of activities, from barn fires, camp outs, introduction classes to Kabbalah, Shabbos Meals, city tours, and cheap kosher food (Kosher under the supervision of the Cheif Rabbi of Tzfat). Whenever I was bored and needed to stir my soul, I wandered over to see the activities schedule and use the wifi. Midnight Fabregeon (Spiritual bull sessions with adequate wine and beer) were full of warm brotherhood and left me with many friendships. Tzfat has some of the best wineries in the world. This is a bit of a surprise to run of the mill tourist, but darn the wine is good here, and it is Kosher. In the center of the Jewish Artist Colony one can find the Abouhav Winery down the stairs from the Gallery. Follow the sign and stay for a wine tasting. It is very very impressive and you will take a bottle or two home with you. I spent a few hours talking and ducking the heat in August, drinking a variety of wines and snacking on fruit. The kid who runs this facility is a gem or a person, and great company. Do yourself a favor and spend a few hours with him. Feel at home. Inevitably, everyone ends up in the artist galleries in Tzfat, and for good reason, this city has what might be the healthiest collection of Artists in Israel, perhaps even in the world. There are two sections, one is highly secular community, which is loaded wth internationally respected talent. And then there is the Jewish artists, an area of moe personal interest to me, who feed on the Gallery, formally known as Yosef Caro/Alkabetz Street. The Gallery is often over run by tourists and birth righters, which is all good. It is anchored on one end by the Safed Candle Factory and the Caro Synagogue on the other end. 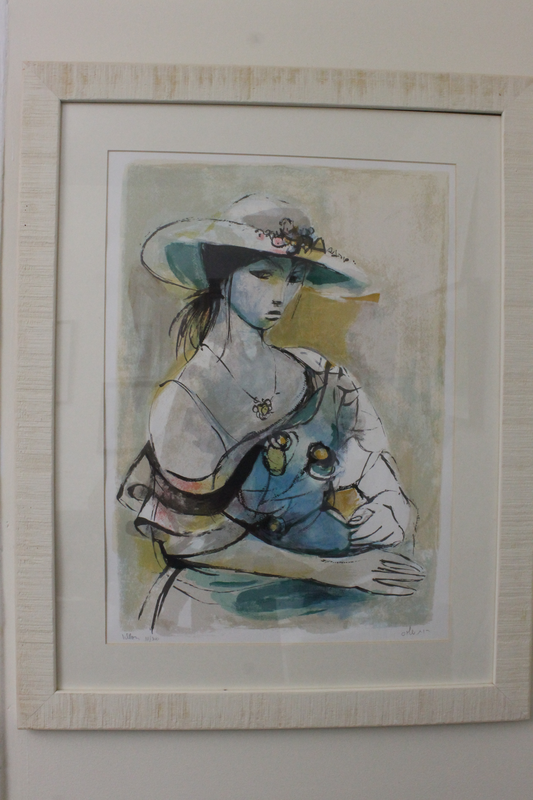 In this regard, Tzfat is a living art museum, and I can spend days walking up and down the Gallery looking over works. I have come to know there artists there personally. They are an amazing group of Jews who have raised the profile of Jewish art to new heights and who create, trade and sell art as a primary industry for the city. There is a lot of original works and prints from a variety of artists within in these cubbies, but also quite a bit of original works, by artists who work with in these stalls. These are living work studios. Of these, my favorite is Idit Aharon and I own 4 works of hers. This is a wonderful work still in the Gallery which is available. Contact me if you are interested in any of these works or interested in purchasing Art from Tzfat. I have inventory on hand and contacts with a many of the great artist of Tzfat and I can arraing an introduction and tour of their works. The inn itself is built on an ancient refurbished multilevel house, with arched doorways, and blazing sunlight through patios and pourches about the property. It is one of the most romantic places in the world. To me, it is always exciting to see fruits trees in the cities of Israel and Tzfat is full of citrus and pomegranates. Pomegranates have become a symbol for the city and is taken up by the artists of the city in multiple themes. Tzfat is most famous for its historical synagogues. There are many of them, and among the most colorful is the Ashkenazi Ari Synagogue that is centrally located. 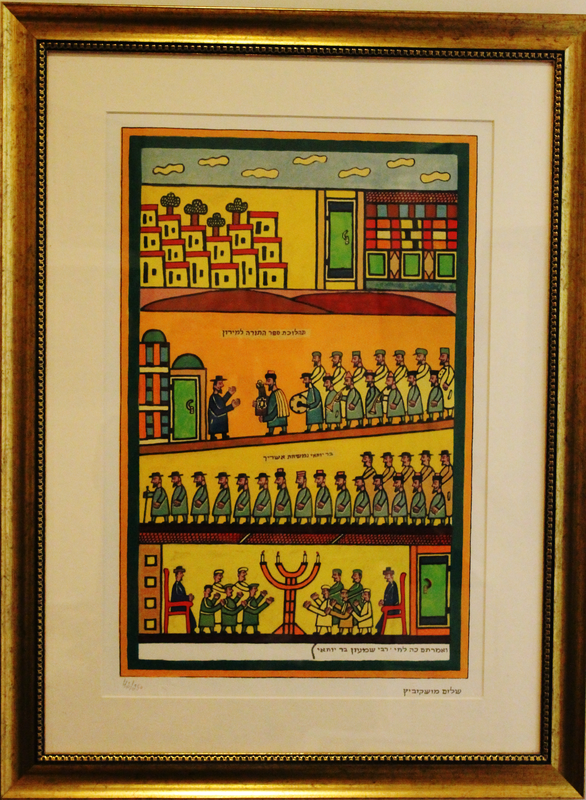 Its Aron Kodesh is one of the finest examples of folk art ever produced and it is hundreds of years old. This Mosaic is in an area south of the Cemetery, on a hill overlooking the grave sites and past the new Breslov housing and compound. The area is currently being used for a Kollel. Not far from the cemetary is the old Ariel Sephardi Synaguage, at one time maybe the most important synagauge in the North of Israel. It managed to survive multiple earthquakes with limited damage, although its main entrances to the old city have collapsed and are not blocked by the Breslov's residential complex. Still it is a very sacred site and beloved. This is the interior of the Ari Sephardi synagogue. It is located near the cemetery, at on time connected to the rest of the city by a bridge which fell after one of Tzfat's earthquakes. At this time, the Breslov Compound completely blocks off this traditional and what must have been a magnificent entrance, and access can only now be reached from an obscure road. It is very difficult to reach on Shabbat without driving. Tsfat has also one of the most fameous cheese producers in the world and the Cheese factory is a most stop over for all visitors. They also have the best Havalah. They are located on the bottom of the hill, a bit out of the main path.